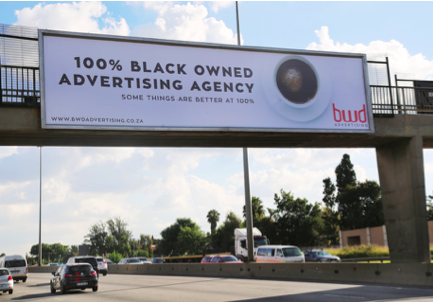 A billboard with the wording, ‘100% Black Owned Advertising Agency. Some things are better at 100%”, using an image of a cup of black coffee, is not racist, the Advertising Standards Authority has ruled. The BWD Advertising billboard, on a footbridge spanning across the M1 South approximately one kilometre north of the Marlboro Drive off-ramp in Johannesburg, was the subject of a complaint lodged by a member of the public in February. After a two-month investigation, the ASA directorate said transformation processes, such as B-BBEE, were the result of government policy, and were aimed at improving the overall wealth and prosperity of those sectors of the community that did not previously have the means to create their own prosperity. The advertisement did not impose “any burden on any person or race and is therefore not in contravention of Clause 3.4 of Section II of the Code”. Therefore the advertisement clearly makes a hypothesis and is justifiable in terms of government’s B-BBEE policy, it said. The complaint was dismissed as the billboard’s message was not infringing on any government or advertising laws. The ASA said BWD Advertising was merely exercising its right to broadcast an achievement and an “edge” it has in the advertising industry. Bongani Gosa, founder and CEO, established BWD Advertising in 2006 as a full service marketing agency. Gosa said the billboard was placed to communicate BWD’s achievement as one of the very few South African advertising agencies that are 100% black owned, which honours the Broad-Based Black Economic Empowerment (B-BBEE) strategy. This mandate clearly calls for companies to increase the number of black people participating in the country’s economy to fight high unemployment rates and challenges imposed by the past. Gosa said he was relieved that the ASA clearly saw his agency’s intention with the billboard – to celebrate, not affront. “I firmly believe in growing our country by empowering the youth. Only if they are mentored correctly, will they lead the country forward without racism and corruption, which is something that I promote passionately. No divided country can truly prosper,” he said. Gosa employs 10 full-time employees and gives five graduates the opportunity every year to gain work experience. BWD Advertising also contributes financially to the the Each One Teach One Foundation, a business mentorship initiative that helps accelerate the growth of entrepreneurs. The foundation gives small-business owners and entrepreneurs the opportunity to get face-to-face time with proven business specialists, enabling upcoming entrepreneurs and owners of SMMEs with expert advice and invaluable insights.